When you get a sunburn, you not only see it, you can feel it—your skin turns red and hurts. But the symptoms don’t always happen immediately. They can sneak up on you. Redness, skin tenderness and pain can take as little as one hour, or as long as 24 hours to fully develop. If the burn is severe enough, you may also experience swelling and sunburn blisters—meaning getting immediate relief is important. Putting a cold compress on the sunburned area or taking a cool shower can help. Gently pat your skin dry and apply a moisturizer while your skin is still damp. 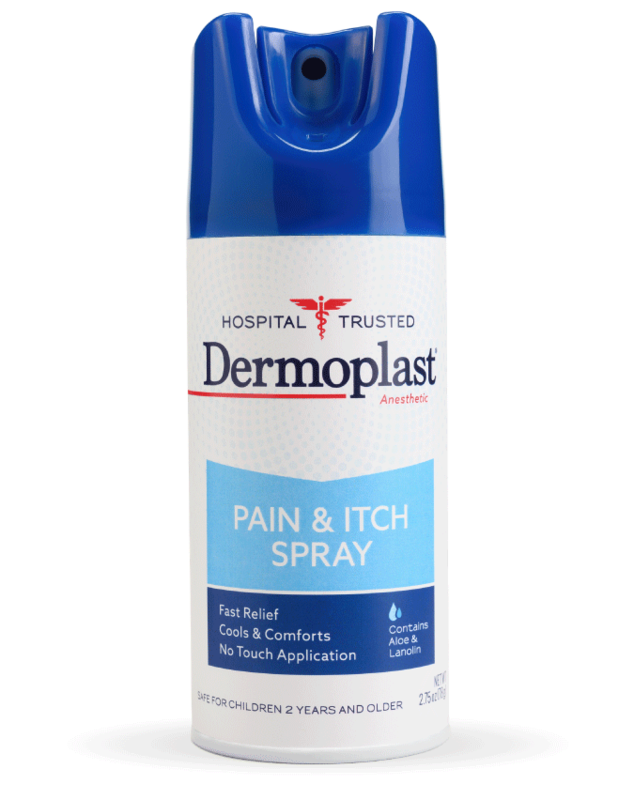 You can also apply Dermoplast Pain & Itch Spray for fast relief from painful sunburn. It is formulated with aloe and lanolin to moisturize the skin, with benzocaine and menthol to provide relief that is cool and soothing. Use as directed. Applying at least 1 ounce of sunscreen roughly 15 minutes before going outside. Wearing protective clothing that have a SPF rating, broad rim hats, and sunglasses. Trying to spend more time in the shade or indoors between 10 a.m. and 2 p.m. when the sun is strongest—even on cloudy days (sunburn is caused by UV radiation which penetrates clouds, so you can get sunburned even when it’s cloudy). Sunburn. Mayo Clinic Website. https://www.mayoclinic.org/diseases-conditions/sunburn/symptoms-causes/syc-20355922. Accessed March 2019. Page EH. Sunburn. Merck Manual Professional Version Website. https://www.merckmanuals.com/professional/dermatologic-disorders/reactions-to-sunlight/sunburn. Updated February 2018. Accessed March 2019. 5 ways to treat a sunburn. Skin Cancer Foundation Website. https://www.skincancer.org/prevention/sunburn/five-ways-to-treat-a-sunburn. Published May 27, 2016. Accessed March 2019. Sunscreen FAQs. American Academy of Dermatology Website. https://www.aad.org/media/stats/prevention-and-care/sunscreen-faqs. Accessed March 2019. FDA Sunscreen Drug Facts Labeling.